Thin film material technology can be applied for high frequency and high-density circuits, Base material can be co-fired multi-layer or monolayer alumina substrates. HTCC ceramic substrates with built-in ceramic components. Base material can be co-fired multi-layer or monolayer alumina substrates. Multiple build up layers are possible with copper Polyimide (CuPi) dielectric applied to the surface layer. 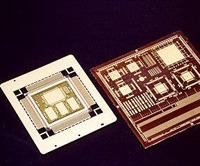 Embedded passives (L and R) are possible within the thin film layer structure.